A modular distributed architecture that is cost-effective, space-saving, and easily maintained. Atronix Distributed Architecture (ADA™) is our unique approach to system control, design, installation, and commissioning. Instead of using a traditional central control panel that consumes valuable floor space, ADA’s patented modular solution distributes the I/O and motor control where they’re needed throughout the facility, eliminating long runs of wiring and other extraneous infrastructure. A single panel distributes 480V power to remote motor boxes, and all other connections and communications are localized and confined to a limited area around each module. Because of our unique modular design, issues are easy to detect and maintenance is simpler. 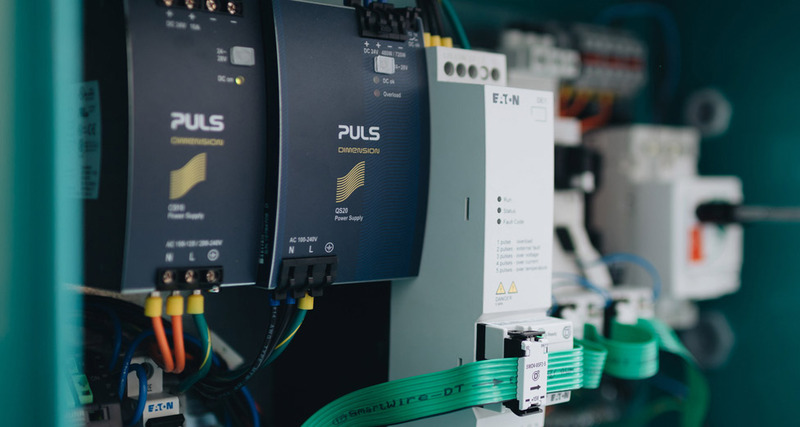 Quick-connect wiring and separately housed high- and low-voltage components mean that installation and maintenance can be done safely by your own technicians with little training, leading to further cost savings. All this means less manpower, less complexity, fewer materials, and enhanced safety, making ADA an integrative systems solution that costs less to install, less to maintain and allows for easier upkeep and expansion than any other controls solution on the market. For information on how ADA can speed, simplify, and reduce the associated costs of your automated system, contact us or check out ADA’s other features and benefits. Up to 40% cost savings on time and materials. • Modular design eliminates long runs of wire. • Compact design means less materials. • Simple set up means you pay less during installation. • Phased installation with no need for temporary controls. • A power distribution panel carries 480V power to groups of ADA™ modules. • Daisy chain power connections reduce power distribution home runs and expensive conduit and wiring. • ADA modules are compact and flexible, so they can be mounted where they are needed without affecting the system layout. Download the ADA brochure (PDF). Is there a “main” central control panel? No! The PLC, I/O modules, motor starters, VFD’s, and all required panel components of the control system are distributed in the small ADA™ panels, distributed throughout the facility. Can I open the control panels while the system is running? Yes! The control panels can be opened while the system is running, without requiring any arc flash protection equipment. Everything in these panels is 24VDC or less, and finger-safe. This allows for safe and easy troubleshooting without causing any downtime. Motor starter panels must be powered down prior to opening, or require appropriate protective equipment. What happens if I power off a motor starter panel? A panel shut-down will only impact the local area and the motors that are controlled by that particular ADA module. The rest of the facility continues to run, minimizing the downtime and the impact of the maintenance. What if my facility expands in the future? Depending on the layout, adding a new area will result in adding additional ADA module(s) to control the new area. A new power drop and Ethernet drop will be required. Other than that, the existing system never needs to be stopped for the controls or electrical modifications! Typical downtime will only be as required for mechanical changes and testing. Does Atronix perform the installation? It’s up to you! Atronix’s installation team is fully qualified to perform the mechanical and electrical installation of all of the items that we provide. Atronix also offers site supervision for customers who would like to perform the installation themselves. Customized modular systems now available for direct purchase. With Build-a-Box, you can now order ADA panels directly from Atronix for whatever project you have in mind. ADA can be used for any electrical control application from material handling to manufacturing. We customize the panel sets to your exact specification, and ADA is flexible enough to change with you as your needs change. Sample ADA Build-a-Box configuration for a conveyor control application (approximately $10K). Is ADA Build-a-Box right for you? Find out with a free phone consult. To schedule yours call 770.840.4045 or email ada@atronixengineering.com.